Eastside Exploration | Meghan Kelly Teles! ← It was worth it! Will, Juliana, and I forged a plan to head down to the Eastern Sierras near Bridgeport for the day to ski a bigger line and just escape the Tahoe Basin and explore a new place. 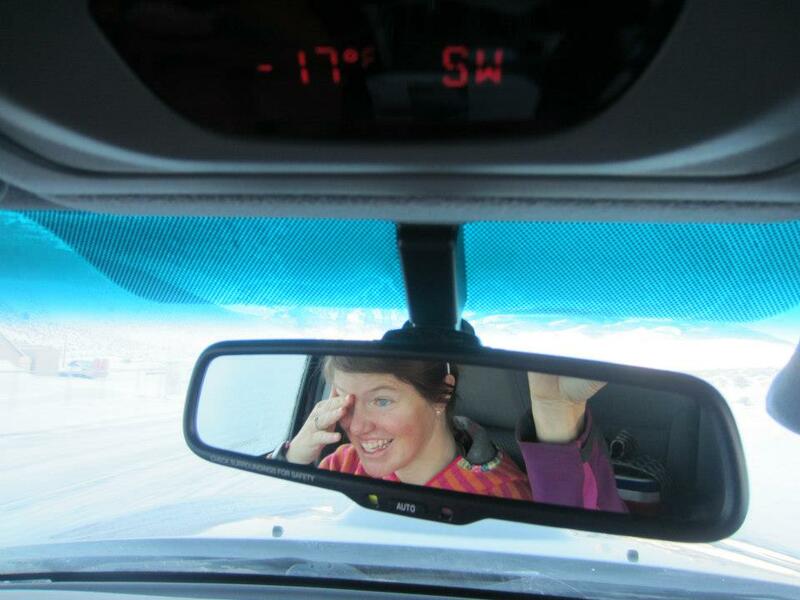 As we made the scenic drive down to Bridgeport, the temperatures fluctuated between really cold and extremely cold with the lowest temperature at -17 degrees. Approaching Bridgeport. Yep, it’s cold. We parked at the end of the road closest to our objective and saw one other car filled with Bridgeport locals heading out for a ski themselves. “Grandmothers on the run.” Bridgeport locals know how to have a good time. Starting our hike around 9:15 am, we weren’t quite sure how to reach the Northern couloirs of Mt. Walt, our days objective, so we just started hiking, hoping to get high enough for an open view. We probably climbed an extra 1200′ or so, but we were happy to get a tour of an area that we were unfamiliar with and Juliana and I even got to make some fun turns before putting our skins back on and starting the real climb. After that detour and a bunch of trail breaking, we approached the base of the couloirs a little before 2pm and they were both in the shade. The low temperatures were nearly unbearable in the shade and the snow looked to be wind affected. Our main objective was also not quite filled in. So we decided to keep it mellow and stay in the sun as we crested the ridge. Stellar views greeted us and gave us more ski objectives. Couloirs looked cold and wind affected, so we opted to stay in the sun and take in the beauty. 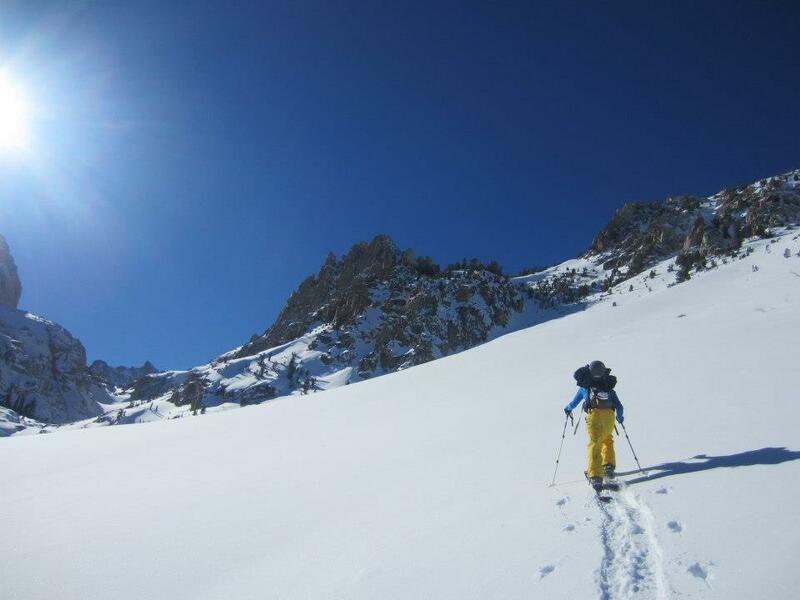 The skiing turned from good to great as we descended – the highlight being a steep north-facing sheltered slope that was just perfect. We made first tracks down the slopes and tried to find a better way in on ski out, skiing right to our cars through some dense trees. At the car we congratulated each other on a successful day in the mountains – we stayed safe, warm, skied great snow, and learned a lot about the area. A backcountry skiing trip to the Eastern Sierras is never complete without a stop at the hotsprings! So despite the single digit temperatures, we hit up the travertine pools just in time for sunset. Will and Juliana enjoying the soothing springs and the stellar views. Great day and I can’t wait to get back there!